The “West,” as that term has been understood since the end of World War II, is cracking up. It consisted, broadly, of the U.S., Canada and Western Europe, the latter slowly recast as the European Union. Domestically, its members were characterized as liberal capitalist democracies — three words that hardly define themselves, let alone their internal relationships as a phrase — notionally committed to the idea of a rule of law and an at least minimal concept of social justice. The latter, spurred by the experience of the Great Depression and the challenge of the Soviet Union, meant the more or less guaranteed provision of a minimum standard of living, including physical sustenance, education and health care. At the beginning, the West still included two major empires, those of Britain and France. These collapsed with astonishing speed in the first two postwar decades, leaving the United States as the only member state capable of projecting significant power beyond the West’s own borders, or of containing the perceived threat posed by Russian and Chinese communism. A string of American-constructed “alliances” in Europe, the Middle East and Southeast Asia took the place of the former British and French empires, leading to a series of ill-fated wars from Korea and Vietnam to Iraq and Afghanistan. These legacy conflicts, with the exception of Vietnam, are still active today. Western Europe, rescued by the Marshall Plan and sheltered by NATO, remained America’s junior partner; indeed, the “West” as a political and economic entity in effect owed its existence and day-to-day survival to American policy and might. As the Cold War between the U.S. and Russia stabilized and the threat of a new war in Europe — or a worldwide atomic one — receded, the two major powers of continental Western Europe, France and Germany, began to develop the transnational institutions that resulted in what is now the 28-member European Union, which has formally or informally absorbed the continent up to the borders of Russia itself. The EU of 400-million strong, now rivals the U.S. economically. Militarily, however, it has remained an American dependent, and politically it has failed to develop a federal democracy. The hegemonic power of Germany within the EU led to its catastrophic response to the financial crash of 2008, in which its poorer Southern members were forced to recapitalize the failed banking institutions of the wealthier North. The political crises of the past two weeks, in which the governments of both Italy and Spain fell, underscore the vulnerability of the system as a whole, while the largest East European states, Poland and Hungary, have continued their slide into nationalist authoritarianism. Britain is in the process of leaving the EU, while the refugee crisis that washed over Europe’s shores several years ago remains critical, and the new government of Italy planning to deport 500,000 men, women and children. Should that even be attempted, the resulting humanitarian and political crisis could of itself tear the EU apart. If all this were not enough, the EU faces challenge from a wholly unexpected quarter, as the U.S. careens through the calamitous presidency of a demagogue unexampled in its history. 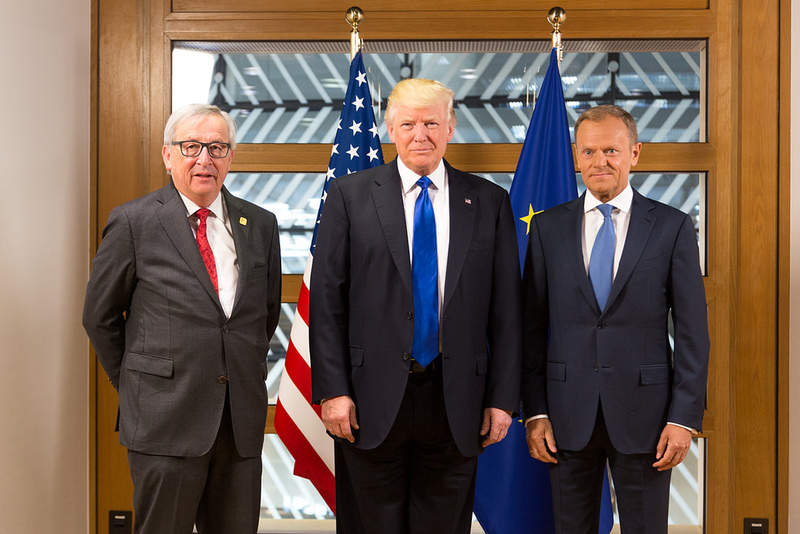 Donald Trump’s contempt for democratic values in general and for Europe in particular has weakened the transatlantic alliance in a year and a half in ways a nearly half century of Cold War never could, culminating in his unilateral withdrawal both from the Paris Agreement and the Iraq nuclear freeze, the two most signal initiatives of Western diplomacy in the present century. At a time when a renascent Russia is seeking to reclaim its former influence in Eastern Europe and elsewhere, the EU finds itself for the first time in 70 years without a reliable American military shield, and no adequate defenses of its own. At a point, moreover, where it desperately needs political leadership and direction, the EU finds itself with none. A reunified Germany had emerged in the past quarter century as the dictating force in the EU, but as right-wing populism has surged across Europe, the centrist-right government of Angela Merkel has lost authority, and seems barely to be governing Germany, let alone the continent. The new French president, Emmanuel Macron, had recently attempted to revive the Franco-German axis to reform the EU, but that initiative has failed, and Macron is in any case an autocrat who has sharply polarized France itself. The EU never had a founding conversation about itself, as the drafters of the American Constitution (itself a flawed enough document) did; it never worked out a governing apparatus of sufficiently clarified powers and democratic accountability; it failed to address the problems of a federal system of nominally sovereign states subject to sweeping ordinances and regulations regardless of size, wealth or political maturity. It plunged nonetheless into the reckless experiment of a common currency and a programmatic expansion, both military and civil, into ethnically combustible territory including parts of the former Soviet Union. In retrospect, it is hard to imagine a project larger in ambition, more fecklessly pursued, and likelier to run aground. The arrogance that governed it was that of a German-American condominium whose origins lay in the first decades of the postwar period, when the US decided that its former enemy in two world wars would partner its containment of Russia. All of this now lies effectively in ruins. Germany, no longer the dominant power in Europe, has been reduced to a middling economic player on the world scene, unable to enforce its will on recalcitrant populations or even to secure its own borders. From Catalan secession in Spain to the flagrant defiance of democratic norms in Poland and Hungary, the EU has sprung fissures everywhere. The modestly social democratic model that was supposed to have absorbed the worst shocks of capitalism has effectively collapsed with the brutal regime of austerity imposed a decade ago in the wake of the so-called Great Recession. The EU has no guiding vision, no unified goals and no popularly supported structure. Nor, in the absence of American commitment, does it have a means of even defending itself against an increasingly assertive Russia. If it has not yet collapsed, it is in part because of fear of what might succeed it — a divided Europe drifting toward the default option of new, nationally-based fascisms. Donald Trump has, it is true, shockingly accelerated this process. But he didn’t create it. Europe’s failure has been its own.